On March 4, former Russian General Staff Main Intelligence Directorate official Sergey Skripal/turned double agent for Britain and his daughter Yulia were found unconscious at the Salisbury UK Maltings shopping center. They’re hospitalized in critical condition, an investigation underway to determine the cause of their illness – believed to be poisoning by a toxic substance, a nerve agent, according to UK police. 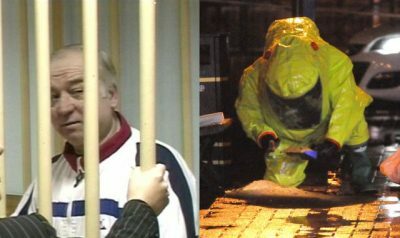 In 2004, Skripal was prosecuted for treason, sentenced to 13 years in prison. In 2010, he and three other imprisoned Russian nationals were pardoned and released as part of a prisoner exchange arrangement with Washington – freeing 10 Russian citizens in America. Putin spokesman Dmitry Peskov said the Kremlin has no information on Skripal’s illness. No evidence suggests Russian involvement in the incident. What possible benefit could Russia gain from his poisoning? Clearly Russophobes benefit hugely by blaming Moscow, an automatic knee-jerk reaction, especially by Western media scoundrels. The incident is similar to the polonium-210 poisoning death of former Russian Federal Security Service/KGB official Alexander Litvinenko in 2006. “We regret that the purely criminal case has been politicized and has marred the entire atmosphere of bilateral relations” – shown by lack of objectivity and bias. Was the poisoning of Litvinenko and Skripal CIA false flags complicit with British intelligence to wrongfully blame Russia? It makes no sense to imagine Moscow had anything to do with either incident. Yet irresponsible finger-pointing is relentless, notably by media scoundrels. No evidence links Russia to poisonings in Britain or anywhere else – CIA and Mossad specialties, ignored by WaPo and other media scoundrels. WaPo’s tirade continued, falsely accusing Putin of “dreaming (about) Russian grandeur…boasting wildly of new nuclear weapons delivery systems…a contingent of Russian mercenary fighters attack(ing) a base run by the United States and its Kurdish allies…on the heels of Russia’s attempts in 2016” to help Trump defeat Hillary. These and similar comments by WaPo and other media scoundrels are totally detached from reality. They reflect longstanding Russia bashing, a daily disinformation onslaught, propaganda war perhaps begging for something hot. Stephen Lendman is a Research Associate of the CRG, Correspondent of Global Research based in Chicago. VISIT MY NEW WEB SITE: stephenlendman.org (Home – Stephen Lendman). Contact at [email protected].